Being pregnant with twins is like double the joy for parents-to-be. And it also means there are going to be cases of sibling rivalries. But a soon-to-be father in China saw his daughter kicking off each other in the womb itself. 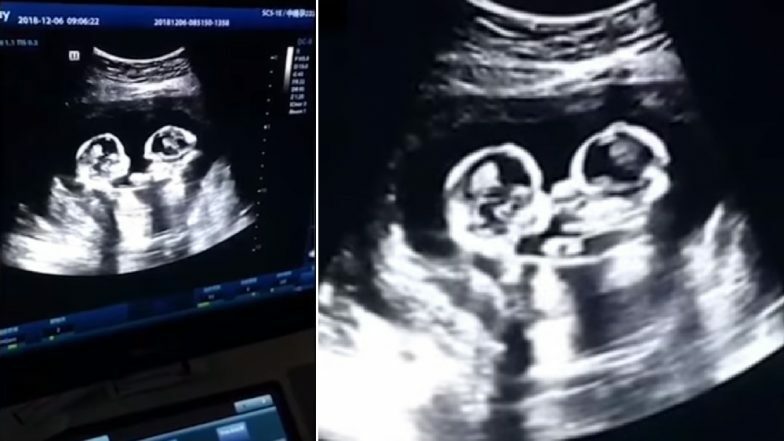 A video of the mother's ultrasound which shows the two foetuses hitting and kicking each other in their mother's womb in going viral on social media. The video is actually a year old and is once again going viral on the internet now. The footage is when the woman was four months pregnant. Texan Woman Delivers 6 Babies in 9 Minutes; What are Sextuplets and How Rare Are They? The father of the twin daughters, 28-year-old Tao had filmed the footage on his mobile camera during their antenatal check last year. He was quoted to local newspapers, his unborn daughters were "boxing with each other for a few rounds". He shared the footage on the video app called Douyin and since then has got over 2 million views. Chinese Mother's One-Night Stand Exposed After Twins' DNA Test Reveals Different DADS! As per the father, this was a rare case of pregnancy since both the girls shared the same amniotic sac and placenta in the womb. It is a dangerous case as the umbilical cords of both the children can get entangled. The two daughters are born and now nicknamed as Cherry and Strawberry. But video from the womb continues to get more views and funny reactions. This wasn't the first such interaction the family saw in the womb. The father said that during another ultrasound scan, he saw them hugging each other. And in real life too, both the sisters deeply love each other.